Part of the National Cycle Network route NCN23 runs across the Isle of Wight from Cowes to Sandown via Newport, the principal town on the island. 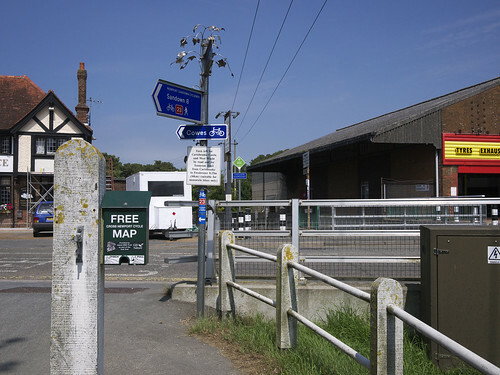 The section from Cowes to Newport runs along the old railway line alongside the river Medina and is well used by both commuters and leisure cyclists. The Sandown to Newport section is equally popular, a scenic route with some smooth tarmac but unfortunately also badly surfaced and muddy in places. Trouble was, the middle bit was missing. Cyclists arriving in Newport from either direction faced a problem – get off and walk through a confusing collection of one way streets and a pedestrianised square, or dice with death on the dual carriageway, one way roads and roundabouts that were somehow deemed appropriate for a small town such as Newport. If coming from Cowes you needed to walk across a busy road, walk through the square dodging the pedestrians, another busy road crossing, then shared pavement (try telling that to the lines of shoppers), yet another busy crossing and then finally a back street to take you onto the rest of the cycle path. Confused? You would be. In summer lost cyclists scratching their heads trying to make sense of the signs are a common sight. But no more! 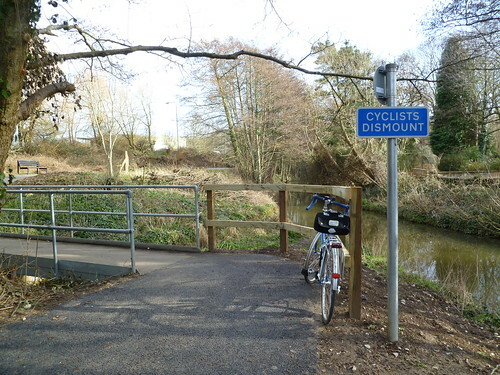 Thanks to a grant of £180,000 from Sustrans and some cooperation from the council it is now possible to cycle across Newport almost uninterrupted. We can now avoid the insanity of the ring road thanks to a spanking new cycle lane. The route continues round a carpark then under the main road to join what used to be a footpath but has now been widened and resurfaced. Its a pretty little route and we have a couple of shiny new bridges too to take us to the start of the Newport to Sandown section. Its even got a nice surface! My only criticism is the number of 'Cyclists Dismount' signs. There are 4 on a short section. Presumably we can't be expected not to try to cycle through the family playing pooh sticks on the bridge without a sign to tell us! Its only a minor criticism of a nice route that makes cycling through Newport a lot more pleasant. Posted by Hilary on March 16th, 2012. Does £180,000 seem a lot of money for what you have now got? Complete with Cyclists Dismount notice across the road (we had come from the right, past the tyre place, and were cycling south – behind the camera). It should be Cyclists Unmount IMO. "I got off my bike" is more common than "I dismounted" but a "Get Off Bike" sign might seem rude. I think the new cycle lane is handsome (so is the bike). I don't remember the dual carriageway but we did zig-zag a lot in Newport. I imagine we'd have enjoyed this new lane. We enjoyed the Isle of Wight anyway. Excellent. End-to-end continuity is the most important feature of a cycling route, and segregated bike lanes make a lot of sense in areas of heavy traffic . Nothing's cheap these days – it sounds like a bargain at 180,000. ... pound sign on keyboards? &#163 ... amazing ... it didn't work that way on my old Brother. I always use that character code for Pound symbols, even though a keyboard Pound sign works for me. This means that someone who does not have the Pound sign in their character set (typically because they are not in Britain) will be able to see one because their browser converts and displays it. Clever stuff, HTML. It does a bit but there was a lot of work involved – a new road crossing, new bridge and turning a muddy footpath into a well surfaced broad track with benches etc. 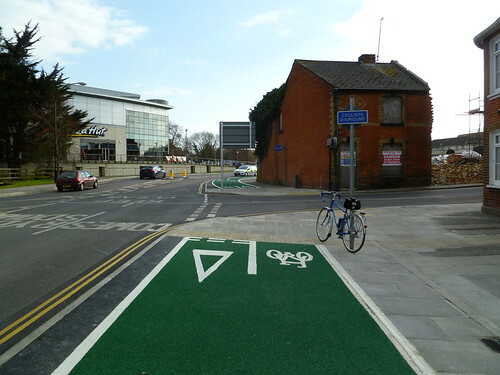 Also that green cycle lane is apparently not just paint but some special anti slip material. Part of the costs were paid by the developer of a new housing estate nearby as it connects his new houses to shops and schools. Patrick's shot of the Cyclists Dismount notice on the other side of the road illustrates the confusing nature of the previous route. You were meant to turn left and then right but because of the dismount notice people tended to assume they should go straight across onto what was only a footpath. As for keyboard symbols I had great trouble tracking down the @ sign in Moroccan internet cafes and other punctuation marks seemed to be completely random bearing no relation to the symbol depicted on the key. I suppose I should be grateful that keyboards weren't in arabic!